I have never backed intervention to overthrow the Islamic Republic but there are times when intervention is necessary to get rid of the most evil regimes engaged in genocide. Had it not been because of the military intervention by the Vietnamese, Pol Pot's Khmer Rouge, would still be in power now and millions of Cambodians would continue to die or live under the most miserable conditions. Other examples that come to mind are the overthrow of the Talibans in Afghanistan and the Nazis in Germany and military intervention to save Bosnians. In other words when a regime is so evil that it engages in ethnic cleansing and mass genocide, and does not allow the slightest dissent but uses maximum force to crush protests, there is every justification for a military intervention to save fellow human beings. If Gadaffi and his clan regain the control of the rest of Libya, there will be a massacre. If the world sits by and allows Gadaffi to bombard its own people in order to survive, it will send a devastating message to other dictatorships, use maximum brutality, do not give any concessions and you will survive. Gadaffi's survival will embolden the rest of the dictators and will mean long term misery for people living under tyrannies. 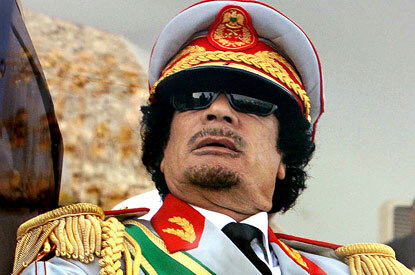 Military intervention in Libya to stop the madman Gadaffi is well and truly justified. Well said! I am going to re-post a quote of it on my blog. Yeah, if only the UN had a proper rapid deployment force to stop such tyrants in their tracks. If a dictator is decreed an international criminal, then why isn't there a proper International Police Force to bring them to justice? Some many argue there is, but if so, it is obviously gummed up by too much hot air to make it effective. Never mind further motions on this and that. Once everyone agrees someone is a danger to the region and it's people via war and violence, that should be green light enough to go in there and arrest them. Why do you trust the people who scuppered democracy in Iran in 1953, armed the Taleban, supplied chemical weapons to Saddam to use against Iranians and arm the House of Saud to put the interests of the Libyan people first? @hanif: first of all that was 50 years ago and secondly contrary to your information the people who removed Mossadegh are the clerics who seized power in Iran in 1979, thats why they hate Mossadegh. As for the Taliban and the House of Saud you are correct however. I think in those regards it was a case of my enemy's enemy is my friend syndrome. Even so rather have accountable democracies intervene and stop the massacre than let Gadaffi go unhindered. So operation Ajax never existed? Come on! All the involvement of the clerics shows is how hypocritical the British government is in the sense it works with the beardies when it suits them! How are the governments who sold saddam mustard gas accountable to the oprhans and widows of Iran? The western governments are not interested in the welfare of ordinary people at home or abroad. And neither are most governments although the western ones have the power to pish their selfish agenda a lot more. A rational & solid argument, and a colossal common denominator. The imbecile, The colonel, with his ludicrous ascent & pronunciation : My beoble (people) love me, wholeheartedly. He intended to purchase the LOVE of his folk with petrodollar. It may be 50 years ago but the British policy of supporting the Mullahs is much the same. The clerics did not come to power all on their own Potkin. It was with the help of their old friends, the British. The BBC supported the so called revolution in '79 sending out minute by minute bulletins. Yet as you well know, they have been suppressing the people's uprising against the IR, especially since the 2009 elections. As an example 25 Bahman when hundreds of thousands of demonstrators came out, they said "only a few hundred came out". Their web site consistently publishes comments from IR supporters,as was the case yesterday in the programme Nobate Shoma when they tried to belittle and diminish the importance of the role of ex-pat Iranian community in Iranian politics. Barely a few days after the fake elections, I went on the BBC website and I was amazed to see most of the comments posted were pro IR! I posted 4 comments myself, none of which were published. What they were deliberately doing was to make out the election results were fair and that most of Iranians supported Ahmadinejad! Operation AJAX failed, it was left to the clerics led by Kashani and his band of street thugs to overthrow Mossadegh, which he duly did. You see here is your logic: People living under some despot are about to be massacred, men, women and children, there is a chance for the Western democracies which you choose to live under to save a massacre and you dig into 100 years of history and say ah but in 19... they did this, so let the people be massacred. The western powers only go to these countries for their OWN benefit. There must be some vested interest for them to consider meddling in Libya's affairs. In my opinion though, it is a good thing. The people of Libya do need help against this madman. But the intentions of the west are NOT humanitarian. They only want to secure their own needs in Libya. Of course what you say it right Potkin. But we are not talking about what happened 50 years ago. We are talking about now. And even now the IR is being supported by the West. It has been propped up for the past 31 years, that is why the IR is so audacious and shameless because they know they have this backing. They know they can do whatever the like with impunity. The combination of good old excursion and merry go round: you intend to keep the "Unsettled Account" open for eternally. The next chapter would be "The Crusades" what they had had done to the poor pious Muslims. Accept the heinous responsibility of Charlatan Clergy Kashani. Of course the Western, particularly the European countries have vested interests. They do not want to be flooded by hundreds of thousands of Libyan refugees. Is this so bad? Germany voices Hanif's concerns. German government says, we do not know exactly who the Libyan revolutionaries are, and we fear we may do more harm than good, so we are against military action. I do not approve this position. It seems it has something to do with the upcoming elections in Germany, though most ordinary Germans support the intervention. I think I understand why some Iranians feel some injustice in this situation. From what I know, Iranian people are definitely better prepared for freedom than Libyan people. Iranians started their freedom fight earlier - or actually never stopped it. I thought that Iran would have liberty long before Libya. Now, Iranians are watching the world help Libyans as it never helped them. Meanwhile, the Mullahs can do what they want because Libya and Japan have all the limelight. It may not be quite fair, but Libyans need help urgently, and nobody can fight at a dozen of fronts. I am optimistic and I think Iran's turn will come soon. I rarely comment here. This is my 2nd comment I've ever made. But, I've been following Azarmehr's blog regularly and as an Iranian I support many of the blogger's viewpoints. To get to the point, even though I support the Libyan uprising, I think the intentions of this current military invasion are clear, as we have seen similar invasions in the past, such as the Balkan War. The way I look at it, the great powers (just like the Balkan War) are playing the "humanitarian" card to manipulate public opinions to divide Libya into West and East. The great powers did this to Germany during Hitler after the war ended. They did this to Yugoslavia. They did this to Korea. They TRIED to do this to Iran (Iran-Iraq war), as a part of Bernard Lewis' plan, which at the time was meant to separate oil rich Khouzestan province from Iran, and today is mostly carried out thru funding British-based separatists and revisionist "scholars". Since the intentions of this military campaign are clear, and because the blogger himself comes from a country (Iran) that has been victim of such a coward act to attack a nation during a time that it's undergoing major changes because of a revolution, I'm having doubts whether an intelligent blogger like Azarmehr can support such a disgusting agenda. Sorry, Azarmehr, but you are a warmonger! And, I hope you publish my comment because it's neither spam nor sexist, racist, profane, or whatever it's called nowadays. And finally, I want to say happy Norooz to the blogger and those here who celebrate the Iranian new year. Noroozet khojaste bad. STW, No Enthusiasm for the Syrian Protests?